Left to right, front row: Jim Hurren, Stanley Johnson, Wilma Klein, Lenora Thom, Jo Martin, Betty Quick, Ruth Downer, Agnes Hutton, Connie Predergast, Dorothy Blundell, Norm Chadwick. 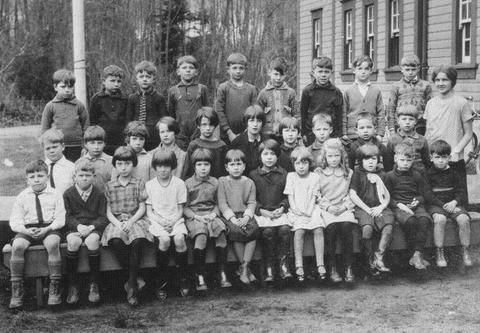 2nd row: John Hurren, Clarence Johnson, Joyce Gratton, Aileen Lamport, Frances Lamport, Marjorie Castle, Keith Kennedy, Jack Confortin, Logan Percy. Back row: Gordon Miller, Sonny Moir, Johnny Sobotka, Bill Martin, Kenneth Buckley, Dennie Singleton, Fred Eadie. Teacher: Freda Lasser (later Mrs Stan Clarke).